Economic migrants are certainly getting a bad press at the present time. What are economic migrants other than people who want to improve their lives for both themselves and their families? Some live in conditions and countries that people would not let their precious dogs live in, so why let people? Admittedly some folk just see another country as having something different to offer be it sunshine or perhaps better schooling for their kids. I myself was an economic migrant some 23 years ago when I choose to move my family to another country. One in which my children were offered a better education system and somewhere where they could actually venture outdoors without adult supervision. 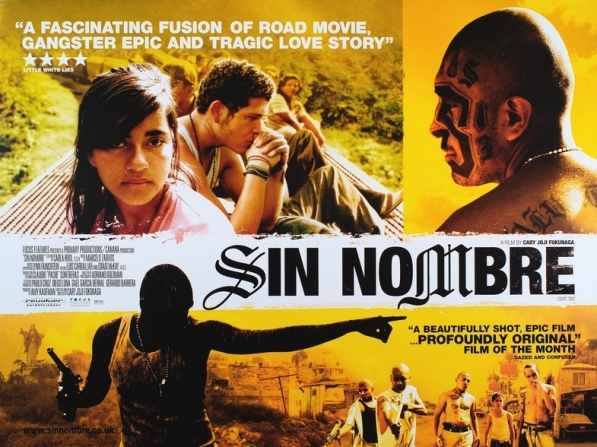 Obviously my situation was nowhere near as serious and heart rendering as the migrants we see in the 2009 Mexican-American thriller Sin Nombre. Written and directed by Cary Joji Fukunaga who was born in the USA but whose parentage was Swedish/Japanese. Fukunaga was responsible for directing all eight of the first season of the award winning HBO TV series True Detective, a truly remarkable piece of work, as is his debut feature film. El Caspers only chance in life is joining Mara Salvatrucha and its leader Lil Mago. Seeking the promise of America, a beautiful young Honduran woman, Sayra, joins her father and uncle on an odyssey to cross the gauntlet of the Latin American countryside en route to the United States. Along the way she crosses paths with a teenage Mexican gang member, El Casper, who is manoeuvring to outrun his violent past and elude his unforgiving former associates. Together they must rely on faith, trust and street smarts if they are to survive their increasingly perilous journey towards the hope of new lives. Shot mostly in Mexico City and filmed in Spanish, the film's title means "Nameless", it won several awards, including prizes for directing and cinematography at the 2009 Sundance Film Festival. It evokes the hardship and violence of a society that gives no real hope for a future or a life. The only opening for disinfected youth is to join a gang where your life can be cut short at any time. Who can blame these people and others in the same position from trying to improve their lives even at great risk to themselves demonstrated in this excellent movie and in the BBC news programmes over the past months? Several of the extras used in the film were actual migrants. Fukunaga said of working with them, "I didn't have to tell them anything—they know how to sit on top of a train” The film stars Paulina Gaitan (We Are What We Are) as Sayra and Edgar Flores as El Casper. The executive producers included Diego Luna and Gael García Bernal. This harrowing authentic movie is recommended for those of you that profess a social conscience and in fact it would not do the back bottoms that don’t have a social conscience any harm to watch it either.